In 2002, Simon Calcavecchia moved to Australia to follow his dream of playing rugby. After his third game of the season, he was injured in a scrum leaving him with c5/6 quadriplegia. Now, Simon has become a children’s book author and a motivational speaker. He visits schools in order to teach a story of perseverance and growth mindset. The messages in his books are meant to inspire optimism and strength when facing life's challenges. 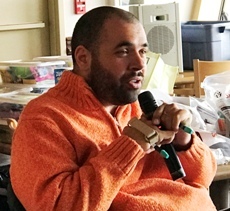 By sharing his stories, Simon hopes that children and adults will see that they have a choice to see their challenges as opportunities for growth. 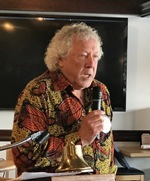 Simon presented his story to GH Midday Rotarians last week, and truly impressed our members with his incredible strength, attitude and energy. 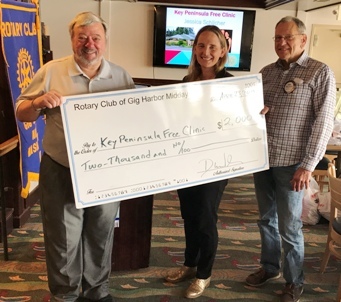 Dr. Jessica Schlicher of the KP Free Clinic talked to the Club last week, and accepted a check in support of the great work they are doing bringing medical care to that area’s residents. Last week Laurel Schultz and Leslie Nitabach spoke to the Club about their organization: Communities in Schools, which serves academic and non-academic needs of underperforming students on the Key Penninsula. The range of Services provided and the dedication of the volunteers and Staff of CIS was a revelation, and truly reflects the Rotary mission of Service Above Self. President Dan presented a check to this exceptional group on behalf of the Midday Club. 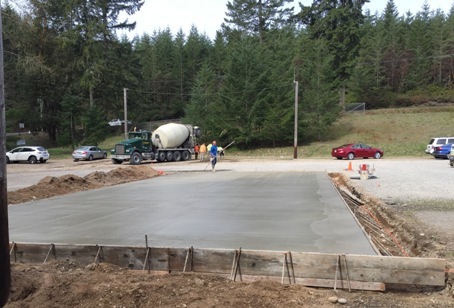 One of the major local organizations Midday Rotary supports is the Red Barn Youth Center on the Key Peninsula. The Red Barn provides after school activities and meals for more than 70 middle and high school students living on the Key Peninsula. Last year, with the help of a $3,500 Rotary District Grant, we donated 30 computers to the Red Barn so that students could do their on-line assignments and research. This year, we worked with the Red Barn to identify a major need. From the discussion, and again with a $3,500 Rotary District Community Grant, we are installing an outdoor basketball/sport court for the students. Red Barn is working with Pen Met Parks for a future roof over the court. 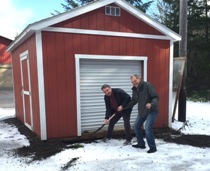 Rotarians Stephen Rainbolt, Paul Raschke, Clint Rosson, and Dan Wilson braved the still snow-covered ground to move an existing Red Barn shed to make room for the court. We left the prep work and cement pour to the professionals. We expect to soon stripe the court and install the basketball standards, hands on Rotarians, so the students can use the court this spring. 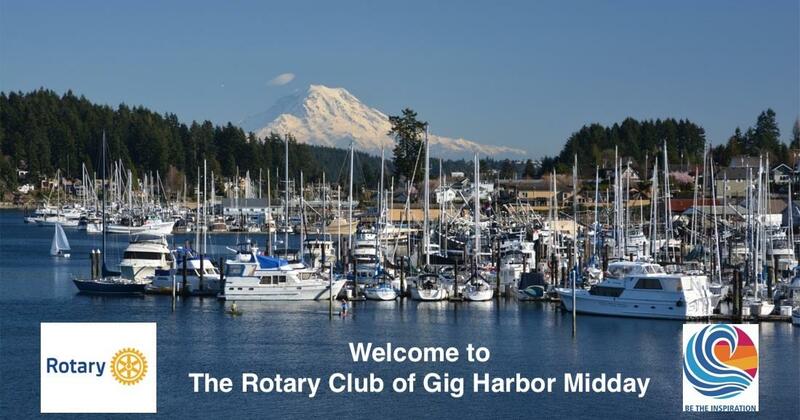 Dan Wilson was welcomed as the Midday Rotary Club of Gig Harbor's new president at an installation dinner Tuesday, June 26, at the Gig Harbor Yacht Club. Wilson, a former executive director for Del Monte, has been a member of Rotary since November 2011, when he joined the Enumclaw Club. He transferred to the Midday Club of Gig Harbor in 2014. He and his wife, Lois, will celebrate their 47th wedding anniversary on Nov. 27. They met at Oregon State University and have no children. Lois, previously the director of operations for the West Coast for a Norwegian ocean transportation line in San Francisco, also worked in corporate finance for CHI Franciscan Health Systems. She now is a volunteer with Franciscan Hospice. Wilson explains how he and Lois came to Gig Harbor in 1996. “After the mass of humanity and smog that was Manila (Philippines), we came across the Narrows Bridge on a beautiful July day, with the Sound like peaceful glass and the Olympics in all their glory. One look and we were hooked, deciding to make Gig Harbor our home,” he said. For 25 years Wilson worked for Del Monte, living in San Francisco for 13 years and then 12 years overseas including Cape Town, South Africa, as managing director, London as vice president of operations for Europe and Africa, four years in Hawaii running the Del Monte pineapple operation, and two years in Manila, The Philippines, as executive vice president for Asia-Pacific. “After retiring, I couldn’t catch salmon and couldn’t hit the golf ball straight, so I answered a call to ministry, entering seminary at age 55,” Wilson said. “I received my master of divinity degree from the Catholic school Seattle University (…a Lutheran pastor trained by the Jesuits!) 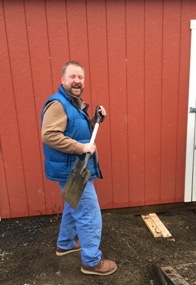 and I served three congregations: Shepherd of the Hills Lutheran Church in Stevenson, Wash., Agnus Dei Lutheran in Gig Harbor, and Hope Lutheran Church in Enumclaw, Wash.” He completed his doctor of ministry degree from San Francisco Theological Seminary in 2014. “I tried retiring again in 2014, but will have to see if that really sticks,” he said. The 2018-19 Midday Rotary president was born in Yakima, Wash., and grew up in nearby Toppenish. He graduated from South Salem High School in Salem, Ore., in 1966, and earned a degree in agriculture from Oregon State University, graduating in 1970. Wilson, the oldest of six children, thinks about all the miles he’s logged since his boyhood days in Toppenish. “It only took me 34 years and more than a million miles to make the three-hour trip from Toppenish (to Gig Harbor),” he said. Wilson reflects on the fascinating life he had living overseas. “I have had an interesting and eclectic career,” he said. “As an international corporate executive, we’ve been blessed to live in three foreign countries and have done business in a total of 33 countries. I’ve flown on the Concorde, and literally flown around the world several times. Together, Lois and I have traveled to more than 50 countries." He said his most “amazing experience” occurred while he was in Cape Town, South Africa, in a squatter camp called Crossroads. Wilson said after a life of ministry, Rotary is a natural extension of his desire to reach out to serve others. Wilson praised the work accomplished by his predecessor, Marilyn Hoppen. “Marilyn has done such a wonderful job as our club president for 2017-2018. 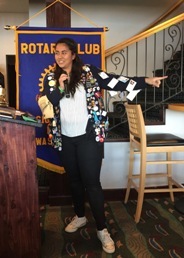 I hope to use her theme of “FUN” to build upon Rotary’s themes for the coming year,” Wilson said. Club membership diversity: education, understanding, and action. Golferitaville – leadership and succession planning. Harbor Hounds – possible event expansion. Web Page and social media. 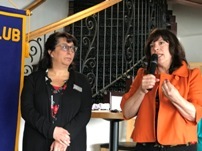 “Using those goals and themes and working together with the wonderful group of Rotarians in Midday Rotary, I look forward to a great year as we live out ‘Service Above Self’ in our community and world,” Wilson said.